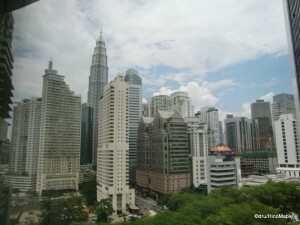 The first day I arrived in Kuala Lumpur (KL), I arrived very early in the morning and I went straight to my hotel. KL is a wonderful city and I read that spending time in a 3 star hotel is not worth it. You should either stay in a cheap hotel or splurge and go for 5 stars. 3 star hotels just don’t offer as much value for your money compared to 5 star and 1 star hotels. Following the advice I found, I looked around and found a good early bird deal at the Shangri-La hotel. 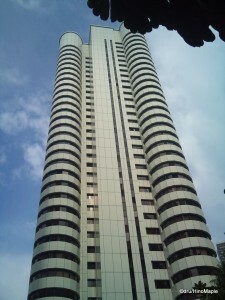 It is located between Raja Chulan and Bukit Nanas on the KL Monorail, or near Dang Wangi on the LRT. Since I arrived in the early morning, before the sun rose, I decided to take a taxi to the hotel. The Shangri-La is a very beautiful hotel and very exotic. The Shangri-La is a Hong Kong based hotel that uses a lot of Chinese themes throughout the hotel and for the hotel staff. I was very impressed by the hotel itself. While the outside of the hotel was not very interesting, inside was a different story. It exhumed class and sophistication, as well as money. While there weren’t too many rare expensive cars in front of the hotel, I did see the typical expensive German cars that can be found in many cities around the world. Checking in was one of the easiest things I had to do. Since I arrived very early in the morning, the front desk was a little perplexed when I did arrive to check in. Most people were just checking out so I wasn’t surprised that my room wasn’t ready when I arrived. The person who helped me check in was very friendly and helpful. She let me get a few things out of my bag and use the pool facilities while my room was being prepared. They even promised to send my bags up to my room once it was prepared for me. 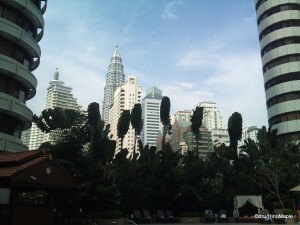 I spent a better part of the morning by the pool where I just chilled in the morning heat of KL. By the time I got changed and arrived at the pool, it was nice and sunny and heating up quickly. I found a quiet area next to some tennis courts and spent the morning watching a movie and checking my messages. Arriving at 7am meant that most of the pool area was free. The only down side to arriving so early was that they were still preparing the pool area for the day and watering the plants. It was still a beautiful pool area and I wish I had swimming trunks to make use of the pool itself. While it wasn’t necessary, I did use the area as much as I could. When my room was finally available, I headed up to my room but was a little surprised to see that my luggage was not in my room. I called the front desk, rather the operator and even services, but had no answer on either line. I was surprised by this but it was no problem for me. I headed down to get my bags and rather than letting me bring them up to my room on my own, they insisted that they bring it up to my room. Within a minute of arriving back in my room, my luggage was there. It was nice but in reality, I was happy to bring my luggage up by myself as it would have been faster. Sometimes 5 star accommodations can feel a bit pushy in terms of the services they offer but it was still very nice. If the service was any less, I would probably complain that it wasn’t a 5 star quality hotel. It is one of those “damned if you do; damned if you don’t” situations. 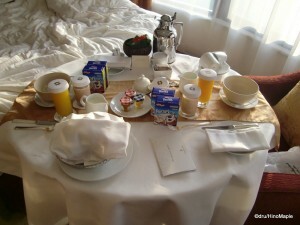 During my stay at the Shangri-La, I made use of as many of the services as I could; including the room service. I ordered breakfast in my room and had a simple continental breakfast. When I go to simple hotels like the Holiday Inn, this usually involves a couple hard buns with jam and coffee. For RM70 or so, I got cereal, bread, croissants, jam, coffee, and fruit. It was wonderful and well worth the money. I was happy to get everything that I did and felt that while it seems expensive I wasn’t really let down by the value of the meal. Considering I had to go to the F1 race and the day before I was also at the F1 races, I would gladly get room service again. My only regret is that I didn’t get a chance to try any of the other foods available to me. If I ever go to a 5 star hotel again, I will definitely spend a bit more time to enjoy the hotel a bit more and order more room service. My only potential complaint about the room service was that I felt cheated if I ordered traditional Malaysian food or stupid if I ordered western food in a South-East Asian city. This is why I ate out most of the time I was in KL rather than utilizing the room service. I also prefer the ambiance of eating out rather than staying in my hotel but I will endeavor to utilize the hotel more next time I visit KL or another 5 star hotel. The only black eye the Shangri-La had when I visited was the door to my room. I was put into the largest room on my floor, a corner room. I was happy with the room and really enjoyed it. The view of the Petronas Towers was not the best but I could still see it from my room. The only problem was that the electronic door lock had a few problems on my last day of my stay at the hotel. It didn’t let us in at first, but after changing the keys, we couldn’t enter the room at all. The latch lock was loose the entire time we were in the room and had trouble opening it up on the last day. While I felt I could just break the door down, I felt bad for trying it so I called for help. Rather than giving us a free drink in the bar while we waited, we just waited for the door to be fixed. It was a bit annoying but it wasn’t anyone’s fault. Maybe I’m just a nice guy but I couldn’t blame anyone for the problems with the door. I’m sure they don’t get paid enough to check every little detail, besides most of the hotel was perfect. 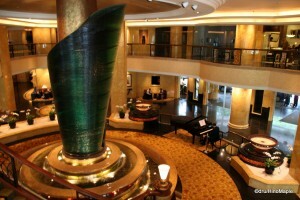 While this post is all about the Shangri-La hotel, I also had the opportunity to visit the Westin Hotel in KL. My brother was staying in the Westin in KL so I had a chance to see the rooms and pool as well as use some of their facilities at the same time. After getting directions from the front staff at the Shangri-La, I walked to the Westin, although the staff did think I was a bit crazy for walking all the way there. I do prefer walking over public transportation as it allows me to see more of the city and do things at my own pace. Once at the Westin, I noticed a lot of things that were different between the two chains. The Westin is very much an American chain of hotels. The theme was very modern when I walked in with lots of glass in the main lobby. The main lobby was actually a bit small and the lounge was also a bit small. The pool was very nice and was a bit better in terms of the pool itself. The chairs were almost the same but they lacked real cabanas to sit on. The rooms were very similar but made use of more hardwood and came with a bathtub. One thing my room in the Shangri-La missed was a bathtub, but I rarely take baths anyways and in KL where the weather is so hot most of the time, there is no real need to use one. The Westin is a beautiful hotel and maybe I’m being a bit biased based on the fact I chose the Shangri-La, but I am very happy to have stayed in the Shangri-La. A 5 star hotel in KL is a pretty good deal if you can book it early enough. 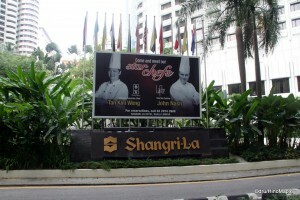 I highly recommend the Shangri-La and think it is a great hotel. I’d love to stay in one of their other chains in the future but I don’t know if I’ll ever have another opportunity to do so. 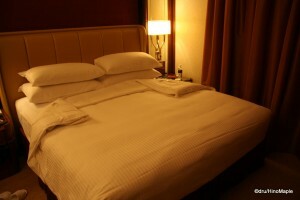 If you are looking for a good hotel that is closer to the action, you should consider the Westin or even the Marriott. They are well positioned but they are also noisier. It is a tough call on where to stay and I haven’t seen all of the hotels in KL, but I would be happy to stay in the Shangri-La again if given the opportunity. This entry was posted in East Asia, Hotels and tagged 5 star hotel, Bukit Nanas, Dang Wangi, hotel breakfast, KL, KL Monorail, Kuala Lumpur, LRT, Malaysia, pool, Raja Chulan, Shangri-La, Shangri-La Hotels, Shangri-La Kuala Lumpur, westin hotel by Dru. Bookmark the permalink. @lina1975 Yup, very posh. 😉 I would do it again too. Except I would make more use of the facilities next time. Maybe order dinner too. That or maybe I’ll try a different hotel. PS: You seldom take baths? Onsen are not included in that statement, are they?! Yes, I seldom take baths, this includes onsen. I have gone less than 5 times, I think. Maybe once a year at most. I used to love Marriott and Renaissance until it got way too expensive for us.